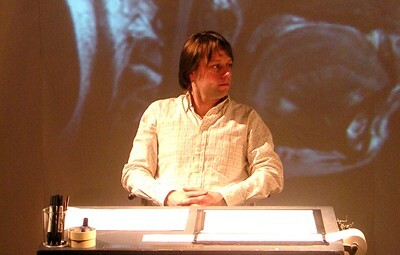 Interview with Alex Kelly, co-artistic director of Third Angel. How does the role of the outside eye sit within your work? Alex: It’s an interesting question for us as it varies from project to project. Within the company, we can have a dramaturgical role as much as a directing role. Because there are two artistic directors in the company, myself and Rachael, we both lead on different projects and quite often the individual who had the idea in the first place will have the final say but the other person might sit outside of the work and offer an ‘outside eye’. What does the ‘outside eye’ bring to the creative process? Alex: For example, when we made Presumption (2006), which was a Rachael-originated project: originally it was a 20 / 30 minute scratch project and I was going to be in it, we both were, and we started bringing furniture on to build a room. We couldn’t get ‘the man’ into it in that one-week’s process, but we tried out both of us ‘building the room’ so Rachael could see what it was like, then we made it with Rachael performing. Then when it became a full-length piece we made it again with Rachael in it, and another writer / performer, Chris Thorpe. I was ‘outside eye’ – in quite a dramaturgical way – and also led on set design. When it came to remaking the show to tour, Rachael stepped out of the piece and redirected it, with Lucy Ellinson in the female role. Sometimes we might have a dramaturg / director for the process and a dramaturg / director for the performance and we are credited in the programme accordingly. So for the Presumption tour, Rachael was credited as director / co-designer and I was credited as designer / co-director. That is one way of defining the roles we play. Is that always the way you work together? Alex: It is different when it’s a solo performance. When I perform a solo piece I look to Rachael more for the detail, the physicality of the piece, how we are talking in which section, whether there should be more chairs or less chairs… so in The Lad Lit Project (2005), Rachael suggested that we should have six chairs even though it was a solo and think about how we sat in a different way on each chair. It is in the detail. Do the roles you take as dramaturgs / co-directors focus on different aspects e.g. text / movement? Alex: It’s not quite as clear-cut as that. Rachael would look at both the text and the movement. It is quite a self-contained relationship because we have worked together for a long time now. We know how each other work. How did you work with Dee Heddon on The Lad Lid Project? Alex: That was different again because it took the form of correspondence we sent to each other so in some ways I could keep the dramaturgy to myself. It was a retrospectively formalised role with Dee, that’s to say that it definitely was the role of a dramaturg she was playing but we didn’t say that at the time. We have worked with people on dramaturgy placements before, students, and we have talked about what dramaturgy might be with them but I think it’s different with our type of work. I knew what dramaturgs at the RSC, for example, did, illuminating the text, but devising is itself a dramaturgical process. Devising is all about associations, generating meanings, making connections. How does it work when you have dramaturgy placements? Alex: Well, we say to those people: anything you think of is interesting and relevant. They are really extra devising brains and sometimes it helps if they didn’t know the company’s work because then their devising brains are fresh. I was wondering how the work you are doing on Story Map (2010) and What I Heard About The World (2010) is informed by a dramaturgical process? Alex: What I Heard About The World was originally developed at the PAZZ festival at the Staatstheater Oldenburg, Germany, and I guess in that context the dramaturg has a more traditional role. We knew that dramaturgical support was part of the offer there so we worked with Johanna Wall from the Staatstheater on the process. She was able to generate connections between the text and that helped to shake the creative process up. It’s useful to present our findings to someone who is both in and out of the process – who can be objective and help us to spot connections. When I saw Story Map this year I wondered if the role Hannah Nicklin played was something similar to a dramaturg, facilitating the process. Alex: Certainly that is what it has become but that wasn’t in her initial brief. We invited her to run the online presence of the piece. But she quickly took on the role of a corroborator, a researcher, someone who could check out stories and validate them for us. Hannah is familiar with the company’s work, she is on our board, and I knew she would be able to work with us in this role. We gave her a minimum job specification and she has become much more than the project’s connection to the internet (though that is still an important role). She is gathering stories and filtering information live as part of the process. Alex: [Laughs] I like this idea very much, this idea of hunting and gathering and nesting. I like the protective idea of that. It chimes with me and I think it probably does describe Hannah’s role at this stage of the creative process. The engine of the piece is that Chris, Jorge and I can play that game on our own – so it opens it up. We needed someone to open it up and Hannah does that. Initially we thought we just needed someone to “go on Twitter” and get extra stories for us, but it became an extra mechanism for the show – so now she is with us as part of a team of four. A Smith, who works with Tim Crouch as an outside eye, said it was his job to represent the audience in the room. Is that what Hannah is doing? Alex: It protects us but opens it out. She is speaking on behalf of the online audience, and she is a bridge between the live audience and the performers. She opens up the conversation and makes it clear that the conversation is possible [for the audience, too]. She is not doing the job of the performance in the same way as the other three of us, but is facilitating it for us. That sounds like a dramaturg’s job description. How does the role you play as an ‘outside eye’ differ from the role you play with Third Angel? Alex: For Ghost Track (2011) with Claire Hind, the role has been a functional requirement for the way it was staged. I have had a set designer / directorial eye on the process. There is an element of blocking to it too, delineating the material, setting the zones. For example, Claire performs a stand up routine and we talked about how maybe it should always happen in a specific zone. Gary Winters (Lone Twin) came into the process as a writer, to create the text with Claire, and I think it was my job to ask questions like ‘Could we tease that strand out a bit more?’ ‘Could we make connections between this bit at the end and something that has happened earlier?’ etc. There is an element of picking up little pieces. Finding fragments from earlier on and bringing them to the fore. I see the dramaturg’s job as to keep asking questions of the work.